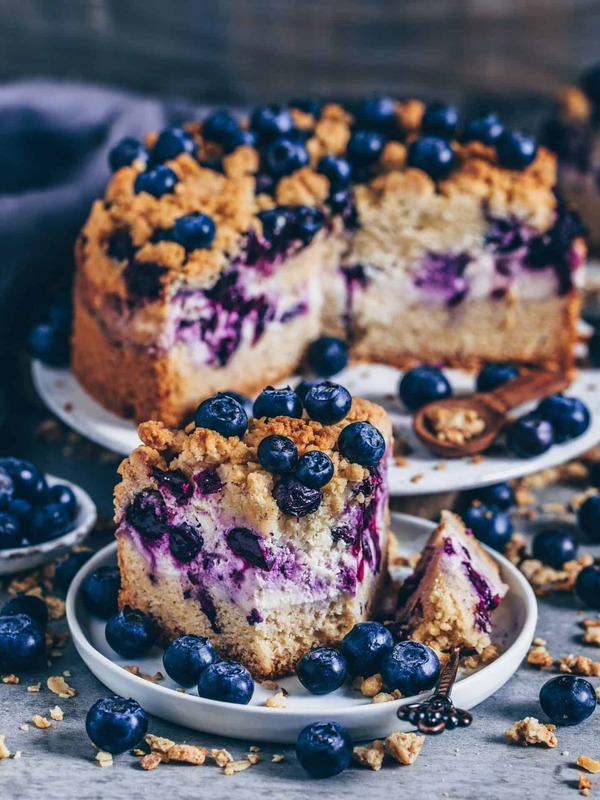 A delicious vegan crumble cake meets a creamy cheesecake – This vegan crumble cake is not an ordinary crumble cake because it also has a creamy cheesecake layer with juicy healthy blueberries that make this cake even more special. 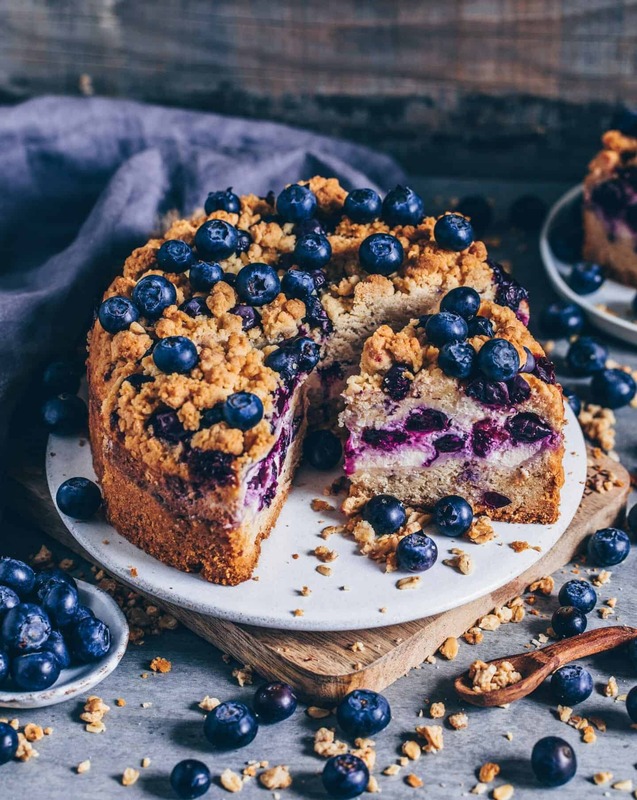 This vegan crumble cake is not only incredibly delicious but it’s also easy to make and you can even prepare it gluten-free, if you like. With this recipe, I have just combined my two favorite cakes, which makes it now to one of my most favorite cake creations. 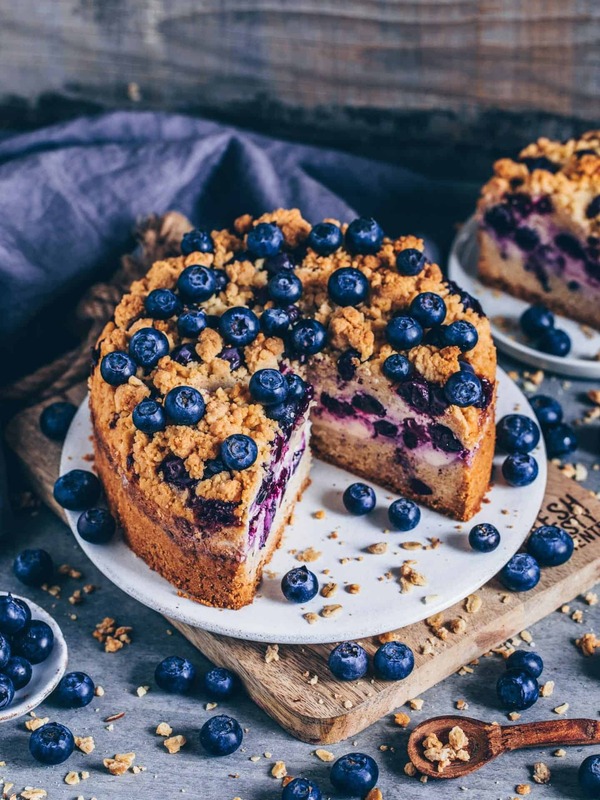 I have already baked this vegan crumble cake very often and I love it. 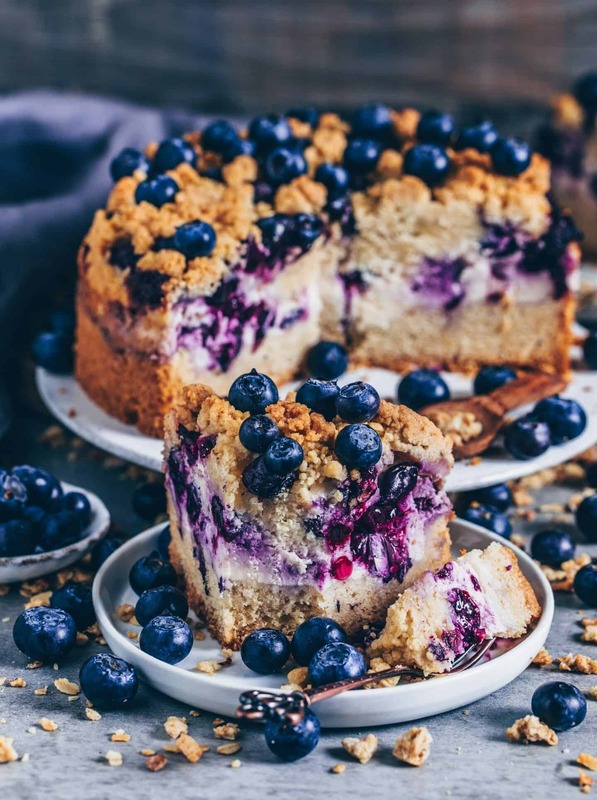 It is made of a delicious crumbly sweet cake crust with a creamy cheesecake layer and juicy blueberries. On top is a delicious layer of crunchy crumbles and even more healthy blueberries that hide between the crumbles. I can tell you, that it sounds at least as tasty as this vegan crumble cheesecake actually tastes. Quick and easy to make – without any dairy ingredients! This vegan crumble cake is not only so delicious, but it is also made easily and quickly. You do not need eggs or any dairy ingredients for this recipe because it is only made of plant-based ingredients. And the best is that this vegan crumble cake still tastes incredibly delicious. As an egg substitute, I simply used applesauce, but you can also choose half a pureed banana or another egg substitute of choice. Instead of regular quark I used vegan soy quark, but you can also use another plant-based quark or drained plant-based yogurt. Another option would be vegan cream cheese, by the way. For sweetening, I usually use raw cane sugar because it caramelizes so nicely, but with another sweetener, such as coconut blossom sugar, works great too. You can add fruits and berries however you like! 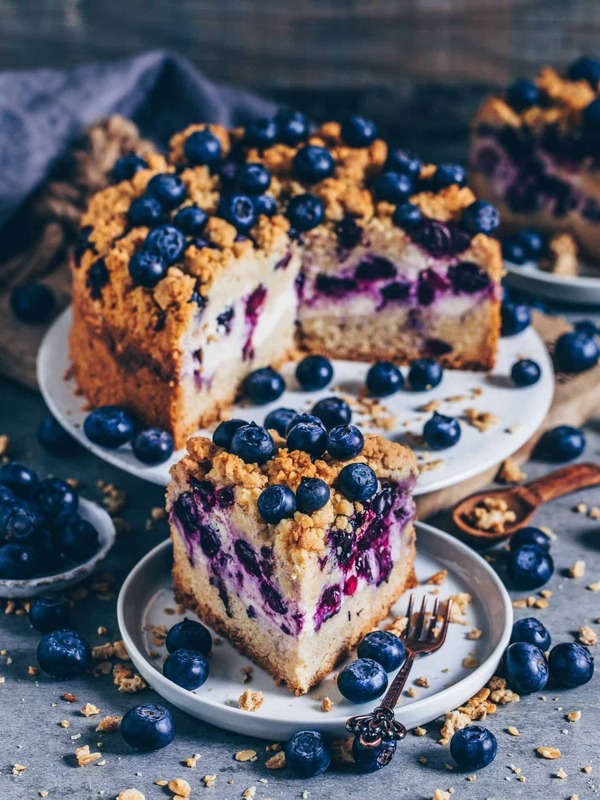 Usually, I bake this vegan crumble cake with red berries, such as in my recipe from the vegan cheese crumble cake with juicy berry filling. However, creating new vegan recipes is so much fun to me and I also love variety. That’s why I vary the basic recipe now and then. Therefore, today’s recipe is again a slightly modified version with blueberries. Anyways, you can also vary this recipe however you like. My grandma, for example, loves crumble cake with mandarins or apricots most. My mother, on the other hand, likes it very much with apples and I like it most with raspberries or blueberries. But I am sure that this cake also tastes great with different other kind of fruits and berries. Next time, I will definitely try it with cherries or strawberries. 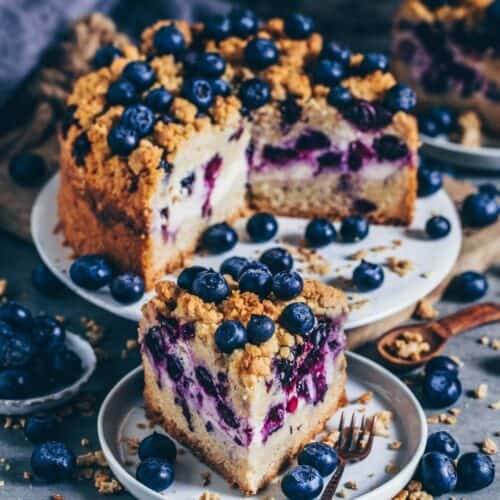 A delicious vegan crumble cake meets a creamy cheesecake - This vegan crumble cake is not an ordinary crumble cake because it also has a creamy cheesecake layer with juicy healthy blueberries that make this cake even more special. 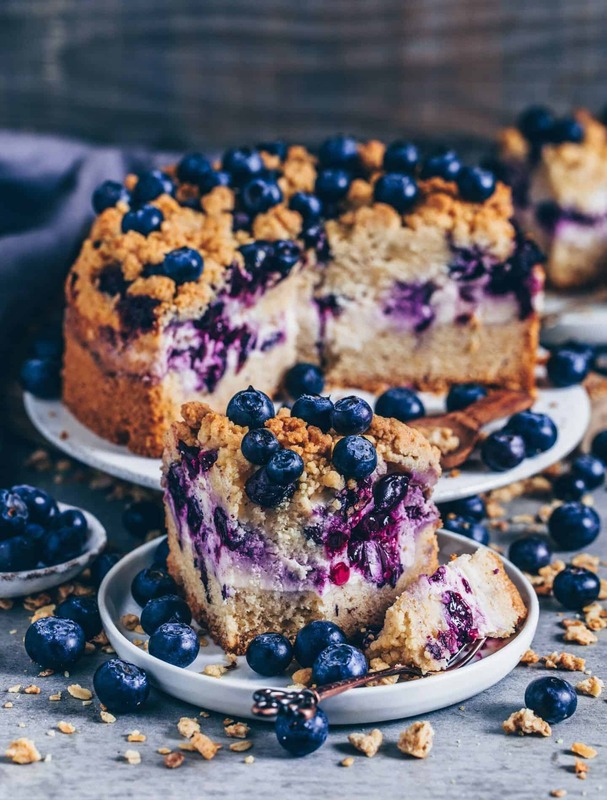 This vegan crumble cake is not only incredibly delicious but it’s also easy to make and you can even prepare it gluten-free, if you like. First mix the flour with the ground almonds, baking powder, raw cane sugar, cinnamon and a pinch of salt. Add the vegan butter in small pieces. Then add the applesauce and knead everything with the dough hook of a hand mixer to a crumbly dough. Then form the dough into a ball, wrap in cling film and place in the fridge for at least half an hour to make it easier to work with. Afterwards, remove the dough from the fridge. Spread 2/3 of the dough evenly in a greased 18 cm spring-form pan and press firmly. Heat up your oven to 175 ° C.
Slowly melt the vegan butter in a saucepan and allow to cool slightly. Now add vegan quark, plant-based milk or cream, raw cane sugar and cornstarch into a mixing bowl or blender and blend well with a hand mixer (or blender). Then stir in soft butter with lemon juice. Finally, carefully fold in 2/3 of the blueberries. Now put the filling on the dough and smooth it out. 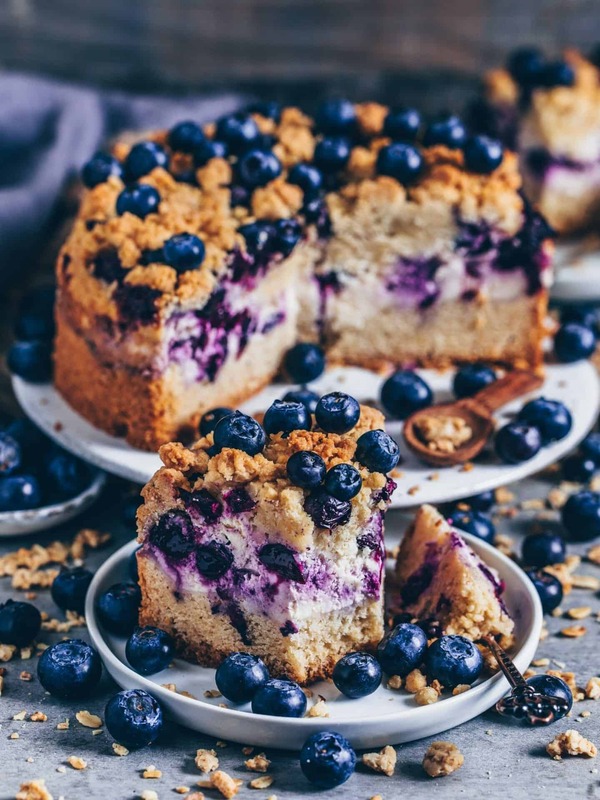 Crumble the remaining dough into crumbles and spread with the remaining blueberries on top of the filling. Bake the cake on a medium rack in a preheated oven at 175 ° C for about 60 minutes. Afterwards, let the cake cool and serve. (Optionally, you can also dust the cake with a bit of icing sugar before serving). Instead of all purpose wheat flour or spelt flour, you can also use a gluten-free flour mixture. I prefer using Alsan, but you can also use regular plant-based margarine. Instead of applesauce you can also use 1/2 pureed banana or another egg substitute of choice. Instead of raw cane sugar you can also choose another sweetener, such as coconut blossom sugar, if you like. If the cake gets too dark on top during the baking time, you can cover it with a piece of baking paper or aluminum foil. 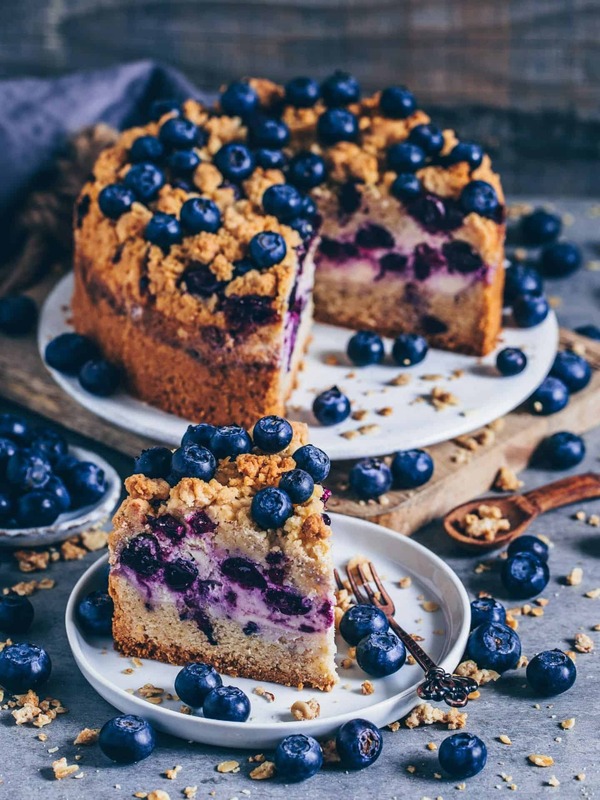 Hi Bianca, this crumble cake looks lovely and I’d like to make it. As baking powder is not sold in little packets here in Australia, can you tell me how many teaspoons or grams that 1/2 package would be? Thanks. So glad that you like this cake 😊. 1/2 package of baking powder is 8 grams. You can easily make vegan quark yourself by simply dripping plant-based yogurt in the fridge for about 12 hours. I usually use a strainer with a linen towel or kitchen paper for this. Otherwise you could also use vegan cream cheese instead. Ich habe den Kuchen heute zu Weihnachten gemacht und er hat allen fantastisch geschmeckt! Das einzige was mich gestört hat ist, dass die Käsekuchenschicht nicht super fest geworden ist und noch ziemlich weich war. Hättest du da vielleicht einen Tip? Es freut mich, dass dir der Kuchen geschmeckt hat! 😊 Ich lasse den Kuchen vor dem Servieren immer noch ein paar Stunden im Kühlschrank fest werden. Ansonsten könntest du ihn beim nächsten mal noch etwas länger backen. I followed all of the steps but the cake doesn’t seem to be cooked all the way through. I’m so sorry to read this. Which kind of baking tin did you use? Maybe you should try using another pan or a larger size? Otherwise, you could also bake the bottom first for about 10 minutes, then adding the cheesecake layer + crumbles and then bake for further 40 minutes or so. Hi I just wanted to ask about the amount of baking powder I should use. The ones sold here in my country doesn’t come in packets 🤔 how many grams should I use? This is the best cheesecake cake that i have Made. Non vegan friends found iT incredible and everyone must try this cake it’s so delicious!!!!! Mindblowing and i prommis you can stop eating! !